Looking for more gluten free vegan desserts? 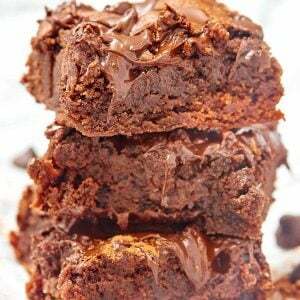 You’ll also love: vegan scotcheroos, healthy zucchini cake, and black bean brownies! 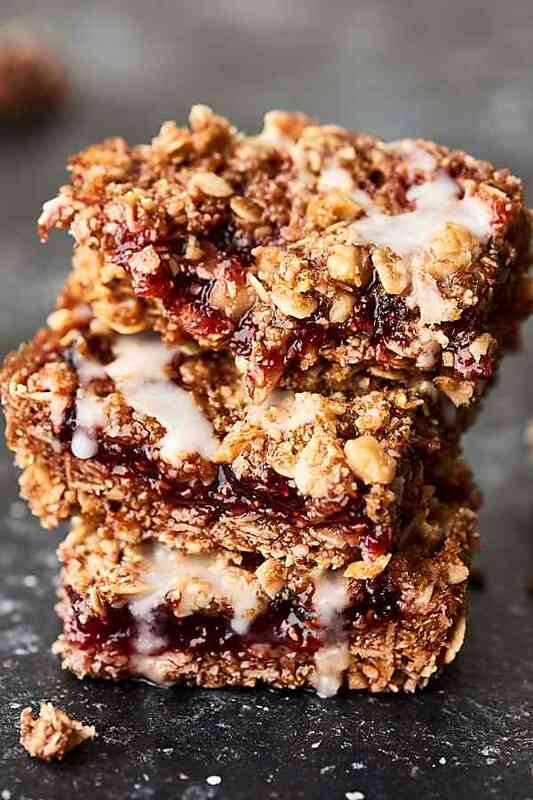 Normally I’m a chocolate dessert girl all the way, but these vegan raspberry oatmeal bars have me singing a different tune. They’re good at room temperature, cold, with or without ice cream, and customizable! Have I convinced you to make these oat bars yet? 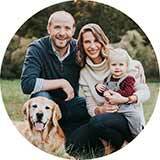 How do I make an oatmeal cookie crust? It’s so easy you guys. You’ll start by making your own oat flour or ground oats. Place old fashioned oats (make sure they’re certified gluten free if you want this recipe to truly be gluten free) into a food processor and pulse until it resembles flour. Set this mixture aside while you whisk together melted coconut oil and dark brown sugar. Mix the dry and wet ingredients together and you’re got yourself an oatmeal cookie crust! Place 2 cups of the crust mixture into a prepared (greased and lined with parchment paper) 9×9 or 8×8 non stick square pan and gently press down until an even crust has formed. 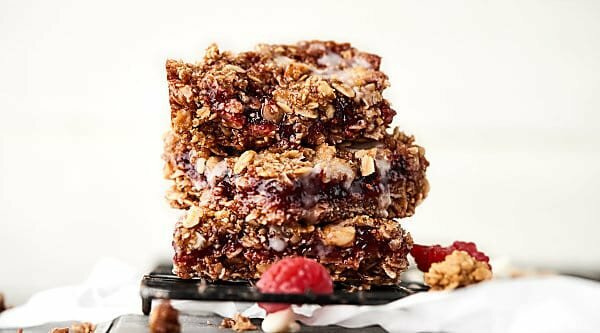 What kind of jam should I use in these vegan raspberry oatmeal bars? I used store bought raspberry preserves. Easy. Peasy. And helllooo delicious. Feel free to use YOUR favorite jam or preserves. Strawberry, grape, peach, blackberry, homemade strawberry chia jam . . .
the options are literally endless! The only important thing is that you like the taste of the jam. I’d also make sure it isn’t sickeningly sweet or else these bars will be WAY way over the top sweet. You’ll pour your jam of choice over the crust and then you’ll top the jam with the remaining crust mixture. Bake for 30-ish minutes (they won’t look TOTALLY done) and then let the bars cool completely. Now. You have some options again. 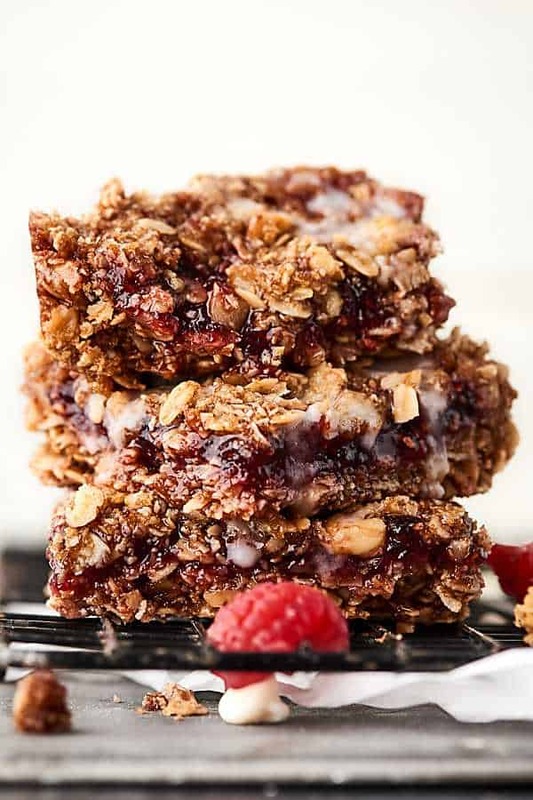 You can serve these vegan raspberry oatmeal bars . . .
As is. Cool ’em, cut ’em, eat ’em. Chilled. Cool ’em (at room temp), chill ’em (in the fridge), cut ’em, eat ’em. With an icing – lemon juice + powdered sugar = sweet, tart, tangy p.e.r.f.e.c.t.i.o.n. With ice cream – I mean. YOLO. Why wouldn’t you?! 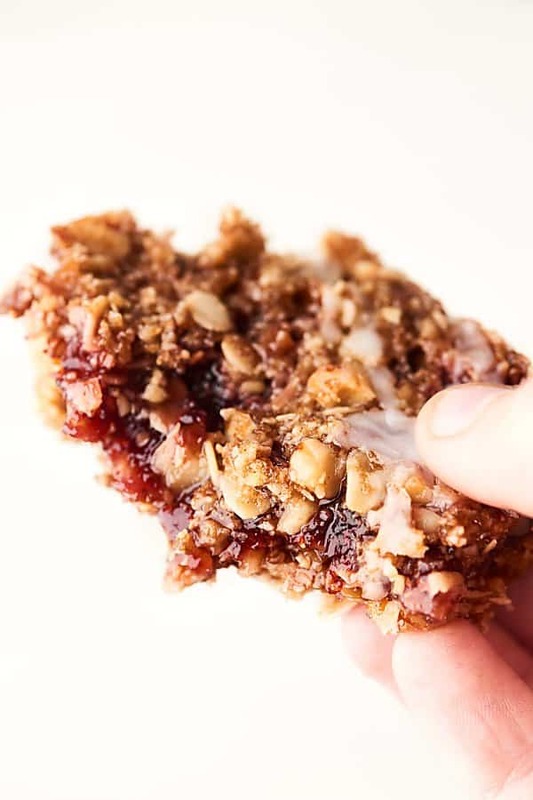 These oat bars are sweet, gluten free, vegan, chewy, and just oh so delicious. Do you want more vegan desserts? What kind? Cookies? Bars? Show Me the Yummy! Line a square (8x8 or 9x9 inch) non stick baking pan with parchment paper and spray with cooking spray. Set aside. 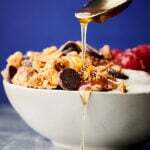 In a large bowl, whisk together melted coconut oil and brown sugar. Stir in ground oats, old fashioned oats, walnuts, baking soda, and salt. Place 2 cups of mixture into the prepared pan. Gently press down until an even crust forms. Pour on jam and spread to within 1/4 inch of the edge. Sprinkle on the remaining oat mixture. Bake in preheated oven for 30-40 minutes or until crust is golden brown. 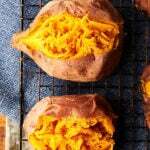 Remove from oven and let cool completely at room temperature. Serving option: cut and serve at room temperature. Serving option: Cut, chill in the fridge in a sealed tupperware container, and serve cold. How to make ground oats: place old fashioned oats into food processor and process until it resembles a fine flour. Then measure out 1 cup. Thank you for sharing this recipe. I made it, today, for my Mom’s Bible study and it was a big hit. I just made another batch for my kids. They begged me to make them some. 🙂 My house smells amazing. Hi – made them just now. I followed directions exactly. The timer beeped at 37 min (my oven is a bit hotter) and when I went to take them out…they are not solid. Maybe when they cool? Is this normal? They are bubbly and look like they need to solidify. Just curious. I am normally a great cook, so I can’t figure it out! They smell amazing though! They solidify as they cool! Thanks a lot for sharing such a wonderful recipe!